Yesterday I got the cutest kitty ever! She's only 7 weeks old. A traditional Persian with a super cute face! 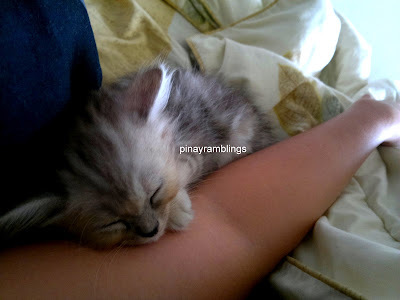 She's my first pet cat. I never liked cats before. Not until Mark showed me his pet Angelina and told me about her personality. I started watching cat videos on Youtube and fell in love--instantly! I bought her from a local cat breeder for 6,500 pesos (US$150). She's the cutest in the bunch! So lucky I got her. 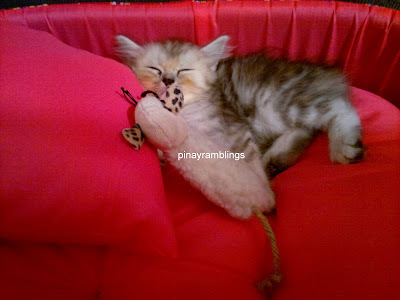 I originally wanted a white persian cat but when I saw this Kitty, I fell in love! 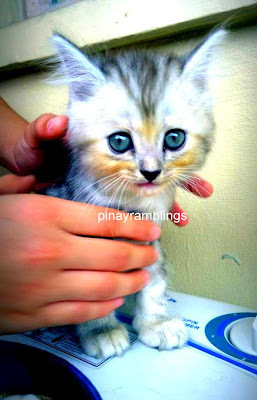 Persian cat breeders here in Philippines prefer the flat-faced persians than the traditional because they can sell for more but I prefer traditional since they have fewer health problems in the long run. I still love dogs but I think cats are easier to manage especially if you live in the city with not much space for a dog (huge backyard etc.) to play at etc. I LOVE cats. I've had both cats and dogs my entire life and love both, but cats are my favourite! And yours is RIDICULOUSLY cute!